Ornamental grasses add texture, form, movement, and sound to a garden in an array of subtle colors, and they look good all season long with minimal care. 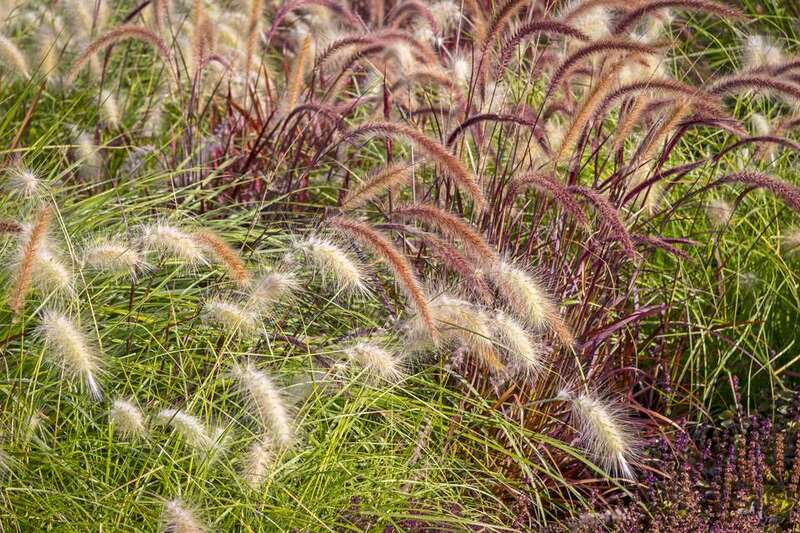 Deciding which one or two to include in your garden may be a tough decision because there are so many attractive ornamental grasses to choose from. Not all ornamental grasses are hardy in every zone, so checking that a grass will grow in your area will help you narrow down the field. You will also want to be aware of whether the grass grows in a tidy clump or tends to spread. But first, you may wish to decide what purpose you want it to serve in your designated area. Is it going to be a specimen plant? The vast majority of ornamental grasses will make showy specimen plants or focal points. The decision then comes down to what grass has the foliage or form that will complement the rest of your garden. You may want a variegated leaf or one with a chartreuse or blue tint, for example. Is winter interest a priority? Many gardeners like to leave their grasses standing throughout the winter. Grasses with stiffer leaves, such as switch grass (Panicum) and indiangrass (Sorghastrum nutans), last longer than grasses with softer leaves, such as Miscanthus. Are you looking for height? Some ornamental grasses spill over like fountains and some, like indiangrass, stand straight and tall. If you want an ornamental grass to give height to a garden, you can find them. Miscanthus (Miscanthus x giganteus) grows up to 12 feet tall, for example. The next feature to examine in order to narrow down your desired plants is bloom time. Dividing grasses into cool- and warm-season varieties is different than classifying them by USDA Hardiness Zones. The zone ratings tell you if a grass will survive the winter in your area. The terms cool- and warm-season grasses refer to when they bloom. Cool-season grasses start growing early in spring, usually as soon as the temperature starts staying above freezing. Some are even evergreen and require minimal grooming and cutting back as they start growing again at the start of the season. Very often cool-season grasses have their most vibrant color while they are actively growing in the spring. Cool-season grasses flower shortly after summer arrives. When they flower, foliage growth slows down. Although they can remain attractive for the rest of the summer, the color gradually fades. Cool-season grasses are especially good for gardens with short growing seasons. In hot, dry conditions cool-season ornamental grasses will go dormant. Cool-season ornamental grasses tend to need more frequent division than warm-season grasses. If left unmaintained, they will die out in the center. Still, some of the most attractive ornamental grasses are cool-season varieties. Warm-season ornamental grasses are slow to emerge in the spring, so don’t be alarmed and think they’ve died off during the winter. Many warm-season ornamental grasses don’t get going until after the spring bulbs have faded. They also flower later in the summer than their cool-season cousins. Many will remain in bloom well into the fall. Warm-season grasses also handle the heat, humidity, and drought well. Many widely planted ornamental grasses are warm-season types. Examples of warm-season grasses: big bluestem (Andropogon gerardii), dropseed (Sporobolus heterolepis), fountain grass (Pennisetum), indiangrass, little bluestem (Schizachyrium scoparium), maiden grass (Miscanthus sinensis), northern sea oats (Chasmanthium latifolium), and switch grass. Finally, a species' appearance during the growing season is important for your garden's look, but the main growth habits you should be concerned with when choosing an ornamental grass are whether it is a clump former or a runner. Clump-forming ornamental grasses are favored by gardeners because they are less aggressive in the garden. Clumping grasses will expand over time, but they tend to stay in a neat mound rather than spreading throughout the garden. Although some clump formers will also self-seed, they rarely become invasive. Unlike the tidy growth habit of clump-forming grasses, ornamental grasses that increase by rhizomes will spread, or run, throughout a garden bed and can quickly take over. Their growth habit is a lot like turf grass. While you want turf grass to spread and become a lawn, this type of growth habit is not suited to a garden border. On the other hand, ornamental grasses with a running habit can make good ground covers, if you want to fill in a large area or stabilize a slope. Grasses such as liriope (Liriope spicata) and mondo grass (Ophiopogon japonicus) are often used as ground covers. Just give them lots of room, and don’t turn your back on them. Growing a rhizome-spreading grass in containers is a good option if you want to include one in your garden without fear of it becoming invasive. Examples of runners: blue lyme grass (Elymus arenarius), ribbon grass (Phalaris arundinacea), and many varieties of Calamagrostis and Carex. Ornamental grasses should be clearly labeled as to whether they are clumpers or runners and whether they bloom in the cool or warm season. After that, it’s a matter of choosing an ornamental grass that’s compatible with your growing conditions and gardening style.